"1918 Toronto Bay and King Armistace Day." Digital image. Wikipedia Commons. Accessed September 4, 2010. http://commons.wikimedia.org/wiki/File:1918Toronto_BayandKing_Armistace_Day.jpg. "Atatürk in White Tie." Digital image. Wikipedia Commons. Accessed September 4, 2010. http://commons.wikimedia.org/wiki/File:Atat%C3%BCrk_in_white_tie.jpg. Capture and Occupation of Palestine by British Artillery. Library of Congress, Washington, DC. In Library of Congress Prints & Photographs. Accessed September 4, 2010. http://loc.gov/pictures/resource/matpc.11524/. CARD MISSING. Khalilullah Enayat Seraj Collection, Williams Afghan Media Project, Williams College, Williamstown, MA. KES-1020-A-389. Khalilullah Enayat Seraj Collection, Williams Afghan Media Project, Williams College, Williamstown, MA. KES-1026-A-395B. Khalilullah Enayat Seraj Collection, Williams Afghan Media Project, Williams College, Williamstown, MA. KES-1032-A-402. Khalilullah Enayat Seraj Collection, Williams Afghan Media Project, Williams College, Williamstown, MA. KES-1211-A-580. Khalilullah Enayat Seraj Collection, Williams Afghan Media Project, Williams College, Williamstown, MA. KES-1225-A-594. Khalilullah Enayat Seraj Collection, Williams Afghan Media Project, Williams College, Williamstown, MA. KES-1227-A-596. Khalilullah Enayat Seraj Collection, Williams Afghan Media Project, Williams College, Williamstown, MA. KES-1235-A-604. Khalilullah Enayat Seraj Collection, Williams Afghan Media Project, Williams College, Williamstown, MA. KES-1239-A-608. Khalilullah Enayat Seraj Collection, Williams Afghan Media Project, Williams College, Williamstown, MA. KES-1242-A-611. Khalilullah Enayat Seraj Collection, Williams Afghan Media Project, Williams College, Williamstown, MA. KES-1246-A-615. Khalilullah Enayat Seraj Collection, Williams Afghan Media Project, Williams College, Williamstown, MA. KES-1256-A-625. Khalilullah Enayat Seraj Collection, Williams Afghan Media Project, Williams College, Williamstown, MA. KES-1268-A-637. Khalilullah Enayat Seraj Collection, Williams Afghan Media Project, Williams College, Williamstown, MA. KES-1659-A-1028. Khalilullah Enayat Seraj Collection, Williams Afghan Media Project, Williams College, Williamstown, MA. KES-1790-A-1159. Khalilullah Enayat Seraj Collection, Williams Afghan Media Project, Williams College, Williamstown, MA. KES-1794-A-1163. Khalilullah Enayat Seraj Collection, Williams Afghan Media Project, Williams College, Williamstown, MA. KES-203-114. Khalilullah Enayat Seraj Collection, Williams Afghan Media Project, Williams College, Williamstown, MA. KES-2188-HG-11. Khalilullah Enayat Seraj Collection, Williams Afghan Media Project, Williams College, Williamstown, MA. KES-632-A-1. Khalilullah Enayat Seraj Collection, Williams Afghan Media Project, Williams College, Williamstown, MA. KES-639-A-8. Khalilullah Enayat Seraj Collection, Williams Afghan Media Project, Williams College, Williamstown, MA. KES-651-A-20. Khalilullah Enayat Seraj Collection, Williams Afghan Media Project, Williams College, Williamstown, MA. KES-662-A-31. Khalilullah Enayat Seraj Collection, Williams Afghan Media Project, Williams College, Williamstown, MA. KES-668-A-37. Khalilullah Enayat Seraj Collection, Williams Afghan Media Project, Williams College, Williamstown, MA. KES-669-A-38. Khalilullah Enayat Seraj Collection, Williams Afghan Media Project, Williams College, Williamstown, MA. KES-675--44. Khalilullah Enayat Seraj Collection, Williams Afghan Media Project, Williams College, Williamstown, MA. KES-678-A-47. Khalilullah Enayat Seraj Collection, Williams Afghan Media Project, Williams College, Williamstown, MA. KES-684-A-53. Khalilullah Enayat Seraj Collection, Williams Afghan Media Project, Williams College, Williamstown, MA. KES-685-A-54. Khalilullah Enayat Seraj Collection, Williams Afghan Media Project, Williams College, Williamstown, MA. KES-686-A-55. Khalilullah Enayat Seraj Collection, Williams Afghan Media Project, Williams College, Williamstown, MA. KES-691-A-60. Khalilullah Enayat Seraj Collection, Williams Afghan Media Project, Williams College, Williamstown, MA. KES-704-A-73. Khalilullah Enayat Seraj Collection, Williams Afghan Media Project, Williams College, Williamstown, MA. KES-772-A-141. Khalilullah Enayat Seraj Collection, Williams Afghan Media Project, Williams College, Williamstown, MA. KES-905-A-274. Khalilullah Enayat Seraj Collection, Williams Afghan Media Project, Williams College, Williamstown, MA. KES-907-A-276. Khalilullah Enayat Seraj Collection, Williams Afghan Media Project, Williams College, Williamstown, MA. KES-934-A-303_1. Khalilullah Enayat Seraj Collection, Williams Afghan Media Project, Williams College, Williamstown, MA. KES-938-A-307. Khalilullah Enayat Seraj Collection, Williams Afghan Media Project, Williams College, Williamstown, MA. KES-940-A-309_1. Khalilullah Enayat Seraj Collection, Williams Afghan Media Project, Williams College, Williamstown, MA. Lyman, Abe. A New Kind of Man. California Ambassador Hotel Orchestra. 1920s. Accessed September 4, 2010. http://ia341011.us.archive.org/2/items/1920s-bigBand-abeLyman-01-10/AbeLymansCaliforniaAmbassadorHotelOrchestra-ANewKindOfMan1924brunswick78rpm_64kb.mp3. Mahmud Beg Tarzi with Daughter Khayriya and Grandson. Khalilullah Enayat Seraj Collection, Williams Afghan Media Project, Williams College, Williamstown, MA. Mahmud Beg Tarzi Working at His Desk. Khalilullah Enayat Seraj Collection, Williams Afghan Media Project, Williams College, Williamstown, MA. "Mamoud Tarzi-203." Digital image. Wikipedia Commons. Accessed September 4, 2010. http://commons.wikimedia.org/wiki/File:Mamoud_Tarzi-203.jpg. "Meso Campaign." Digital image. Wikipedia. Accessed September 4, 2010. http://en.wikipedia.org/wiki/File:Meso_Campaign.jpg. It was the roaring twenties. New technologies, new music, and new fashion were transforming the world. Radios and telephones made the world smaller, moving pictures and automobiles made the world faster. But the change wasn’t just about technology. It would also be about values. And nowhere were the values being challenged more than by the king and queen of Afghanistan. The world had been ripped apart. By the end of World War I, 15 million lives were lost around the globe. But the fighting did finally end, and when it did, the world needed rebuilding. Across the globe, a new hope for the future was coming to life. That hope believed that a revolution in values and technologies would put to rest the madness of war. Afghanistan remained neutral during WWI, but the impact of the war was anything but distant. Nations vied for the country’s support, and the king, Habibullah, played his suitors off of each other. But only a few months after the Armistice, King Habibullah was assassinated. In February 1919, his third son, Amanullah, took the reins. Amunallah understood that the world had been radically transformed. And he knew that Afghanistan could take a prominent place in the new order if the country underwent quick and serious changes. He sought guidance from Mahmud Tarzi, an Afghan intellectual who had once been exiled and had lived abroad in Turkey and Syria. And he had been, during his exile, had lived in the Middle East and had been very influenced by movements in the Middle East for modernization for trying to decolonize the Middle East, to bring Islam into a new renaissance, a new period of flowering intellectually and politically, that looked, it was a movement that looked to indigenous roots, to Islam itself, as an example for education, modernization and reform. This new interpretation of Islam was being embraced by elites across the Muslim world. They believed that a modernized Islam could coexist with westernization, allowing Muslims to excel in the 21st century. Tarzi provided Amanullah with intellectual inspiration for a new Afghanistan. He also provided the king with a wife. Amanullah fell in love with and married Tarzi’s daughter, Soraya. And they had a marriage that, by all accounts and from all evidence that we have, was a real, romantic love affair….And you see in the archive, photographs of Amanullah and Soraya in very romantic poses, with Soraya’s hair down, dancing, very intimate photographs for the time. Together the new king and queen set out to transform Afghanistan. Over the next decade, they built schools, started an air force [picture], established a national bank and a national currency. They supported education of all sectors of society including women and nomads. Like Ataturk in Turkey, Amanullah was obsessed with the idea of using clothing to express a new world order. And he was fascinated with playing with that clothing, and I have a feeling, playing with identity as well. One of the things that he did that also was very controversial, was he held a national loya jirga … in 1927. And he made all the delegates to the jirga where Western suits and hats…And all these proud Afghans look vaguely ridiculous wearing these baggy suits that were not tailored and not meant for them. And they look a little bit embarrassed to be made to wear this kind of clothing. But it makes you realize that Amanullah, one of the mistakes that he made is he sometimes modernization in a very superficial way. He viewed modernization, the accoutrements of modernization, more than the substance of it.…And he encouraged all the members of his court, the women in the court, to wear Western style clothing and to go with no veil or a minimal veil. At a public function, Amanullah denounced the veil, saying that nowhere did Islam require women to cover themselves. Soraya responded by ripping her veil from her face, as the wives of other officials soon followed suit. Soraya knew that her clothing was being watched by her entire country, and she wanted to make a statement. Soraya was the first or one of the first women to wear Western clothing outside the palace, in public places. And she would make concessions, certainly, to local norms and expectations, including she would wear a veil of a sort, but it was a very light veil that you could see through and attach to a flapper hat, a very 20’s style fashion. And so she would make certain concessions, and within the boundaries of Islam she was dressing appropriately. She was covering her hair, she was covering her arms up to her wrists. She was covered to her ankles, although she also sometimes wore stockings. But they were always pushing the boundaries of fashion. But together, the king and queen appeared to some factions as focusing more on style than on substance. This would prove to be their Achilles heel, and the symbols of change would be more troubling than the change itself. 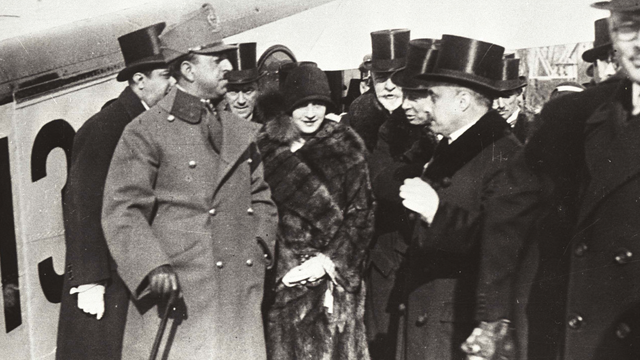 The clothing of the royal couple became flashpoints for opposition to Amanullah. And the more gradual, more incremental reforms that he also was backing, which could have resulted in positive change in Afghanistan, got bowled over by the opposition to these symbolic, relatively unimportant reforms. And so I think that that was one example of the kinds of mistakes – not only Amanullah, but that all reformers in Afghanistan have tended to make. They’ve mistaken the superficial symbolic aspects of reform, they’ve allowed those to interfere with the more substantive reforms of livelihoods, education, industry – that would incrementally have allowed Afghans to create a whole different way of life from the ground up, avoiding some of those hot-button issues that have been so disastrous in Afghan history. In 1927, Amanullah and Soraya went on a tour to Europe where they were the darlings of the political and intellectual circles. They were the “It” couple of the 1920s, working to build a new post-war society where modern values could flourish. But at home, they were not as popular. While they were away, opposition to their reforms mounted. By 1929, an uprising, led by Habibullah Kalakani, broke out in Jalalabad and the couple was forced to abdicate the throne. They lived the rest of their lives in Europe. The roaring twenties had come to an end. The Roaring '20s were known for edgy fashions, new technology—and a pair of rebel royals in Afghanistan.